Every music teacher knows how much students just want to experiment (make lots of noise) when they come into a room full of instruments. As people, this probably drives us crazy, but as teachers, we should rejoice in the enthusiasm and curiosity! In the first few lessons of the year, I just let my pre-kindergarten children go nuts with a carefully selected set of instruments. The first lesson I just put the instruments out and let them play. Without much more prompting, I encouraged the students to sort their findings into “shaking”, “tapping” and “scraping” instruments. 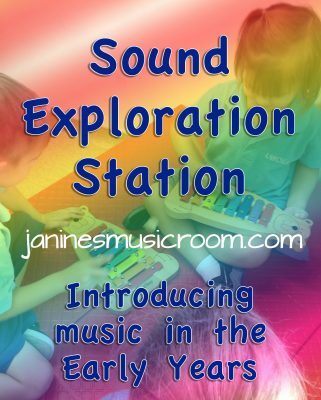 In the second lesson, I prompted them to think about a new way to make sounds on the instrument, and to figure out how to make both loud and quiet sounds. Some students started slowing down and really examining their instruments now. By the third lesson, some of the novelty had worn off–*some*–and more students were finally exploring with more purpose. Each child’s “moment” was fantastic to watch, as they went from shaking and banging with all their might, to carefully turning instruments in their hands, following the sticks and beaters with their eyes, and playing the instruments right next to their ears. It [the wave drum] sounds like ocean music. Listen! This one [triangle] makes a high sound, and that one makes a more high sound. What kind of sound does that one make? You can tap here, but it [the tambourine] also makes noise when I push my fingers on it. [whispering] Can you hear this? It’s so soft. *It’s a discussion for another day, but always make sure your students are using instruments with good sounds! I’m often appalled at xylophones or glockenspiels that are not in tune, bells that don’t have a nice ring, and other abominations labeled as “children’s musical instruments.” Some of the instruments I have kept in my room are linked below.